Boating through marsh waterways at the PIE-LTER site. The eddy flux tower monitors changes in the system’s carbon balance, which could affect plant growth in the marsh. Kelsey piloted the boat up a smaller creek, stopping in front of a wooden-plank boardwalk leading to a tall eddy covariance flux tower. The tower comprises a series of instruments that take regular measurements of air temperature, relative humidity, carbon dioxide, water exchange, soil temperature, soil heat flux, as well as changes in the water table. Together, these measurements create a picture of the carbon dioxide exchange, evaporation, and energy exchange in the coastal marsh. Put simply, the flux towers record the very breathing of the marsh ecosystem. The PIE-LTER has two eddy flux towers, including continuously running Nelson 2, named after the high marsh creek. The second flux tower at the low marsh site – Shad – is also named for the local creek. Since 2011, they have provided a detailed snapshot of carbon exchange within this Massachusetts salt marsh. Why monitor carbon exchange? Saltmarshes are important carbon sinks. When carbon dioxide is released into the atmosphere, it captures heat energy from the sun, acting as the main contributor to global climate change. Saltmarshes, like those studied by PIE, store carbon in mud beneath the tidal waters, as well as in the marsh grasses themselves as they grow, die, and decompose. However, increased temperatures and other climate changes in turn change the dynamics of the saltmarsh. Do higher temperatures speed cordgrass growth, sequestering more carbon? Does decomposition also increase, releasing additional carbon into the atmosphere? 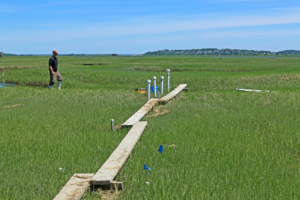 Does sea level rise change plant composition in tidal marshes? 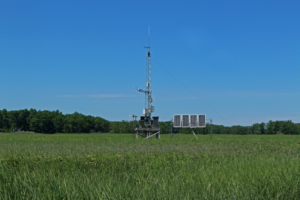 Eddy flux towers help answer these questions by monitoring carbon exchange in the atmosphere over time, and the pair of towers measure these changes in both high and low-elevation marshes. In particular, researchers are watching to see if the increased flooding from sea level rise causes one type of marsh grass – Spartina patens – to gradually shift to another species – Spartina alterniflora. Because Spartina alterniflora has larger leaf area, they postulate that net carbon uptake is higher where this species dominates, reducing the carbon in the atmosphere as more is sequestered within the marsh itself. Narrow walkway through the marsh, leading to the Eddy Flux Tower at PIE-LTER. As climate change continues to alter temperature and climate patterns, the eddy flux towers at PIE will quantify corresponding changes in the coastal system’s carbon balance, and which direction the plants on site may be shifting. 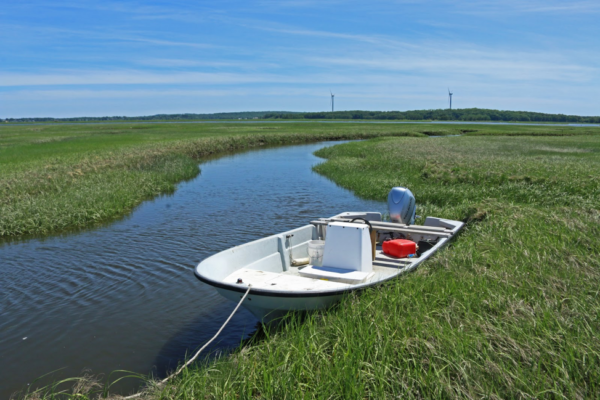 Cordgrass and other marsh vegetation create critical habitat for commercially important fish and invertebrate species, so changes in the marsh could have lasting implications for the entire New England community.